Just switched from 10.04 to 11.10. I'm wondering about the limited options in the GUI for managing users and groups. Where is the old GUI to change groups, id's, etc. I know that I can do this from cli, that's no problem. But I want this comfortable GUI back. This answer was merged from a question about how to make a user an administrator; while it does answer this more general question, making administrators is its focus. Before actually managing users and groups, if you want to make one or more users administrators, you should know what it means to be an administrator in Ubuntu. This power is conferred to users by membership in the appropriate group. 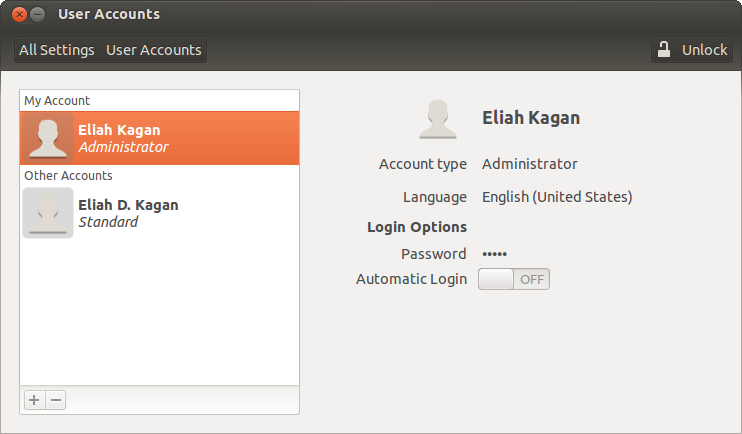 In Ubuntu 11.10 and earlier, administrators are members of the admin group. 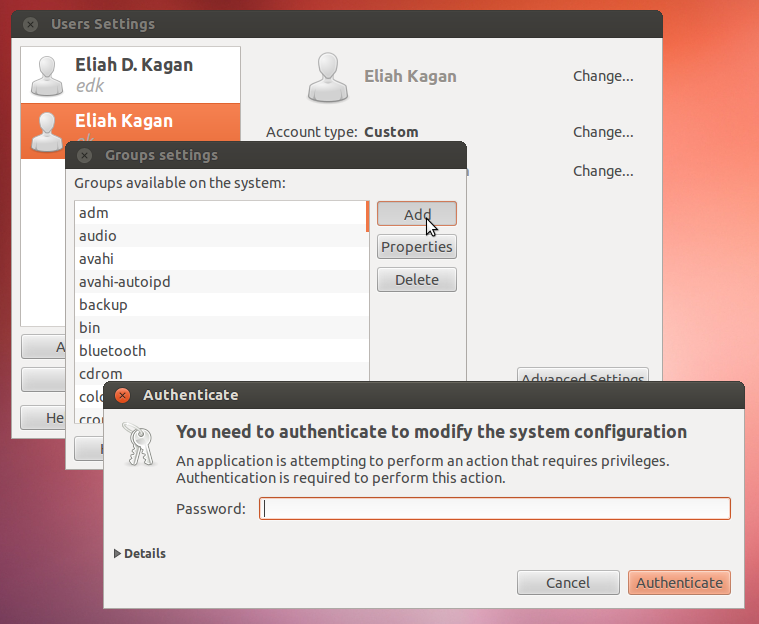 In Ubuntu 12.04 LTS and later, administrators are members of the sudo group. The sudo group exists in 11.10 and earlier, it's just not used (by default). The admin group doesn't exist on a freshly installed 12.04 system, but it continues to exist (and its members continue to have administrative abilities) on Ubuntu 12.04 systems upgraded from previous releases. 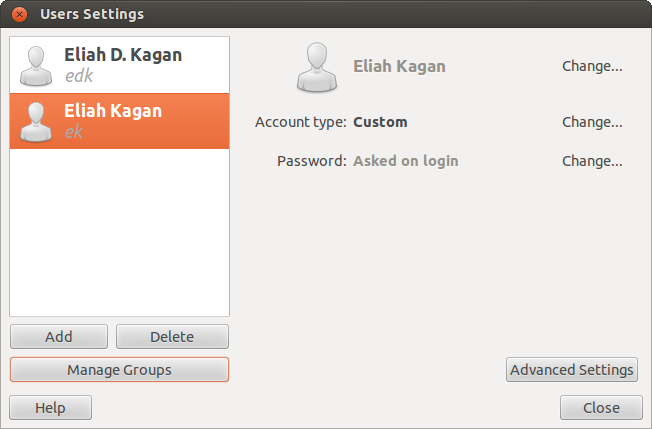 If you're running Ubuntu 11.10 or earlier, just put the user in the admin group. If you're running Ubuntu 12.04 LTS (or later), put the user in the sudo group, and if the admin group exists, put the user there too. You have a few options for managing users and groups. You'll perhaps be happy to hear that (as John S Gruber has pointed out) the old GUI utility for managing users and groups still exists, though you may have to install the package that provides it. I'm talking about the utility that was invoked in menu-driven interfaces via System > Administration > Users and Groups. Press Alt+F2. Type users-admin. Press Enter. Press Ctrl+Alt+T. Type users-admin. Press Enter. In Unity, start to type users and groups. So long as gnome-system-tools is installed, the Users and Groups utility will come up. 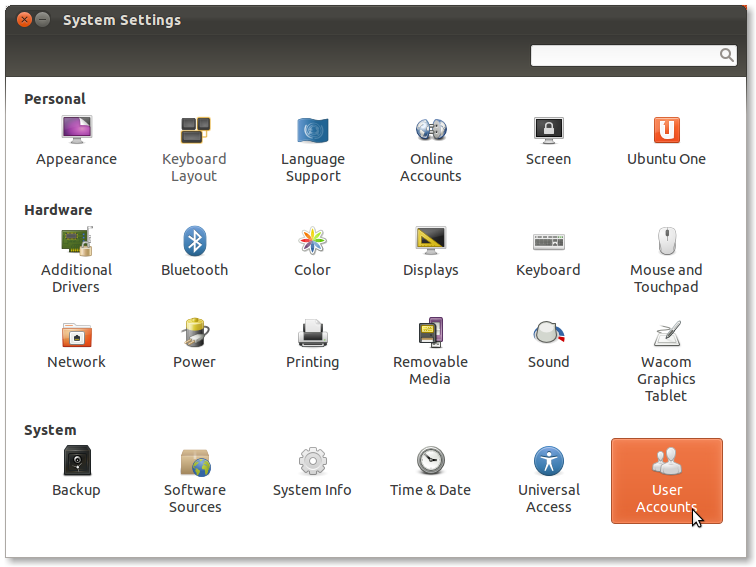 If you use a desktop environment that has menus, find Users and Groups in the Administration, System Tools, or Preferences menu. On some Ubuntu variants, such as Lubuntu, users-admin is already installed and is the standard way to manage users and groups. 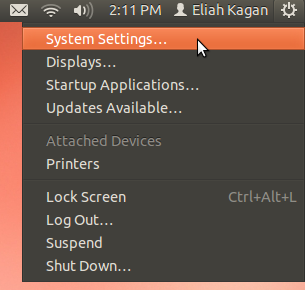 In System Settings (also called the GNOME Control Center), click User Accounts (it's near the bottom, in the "System" category). 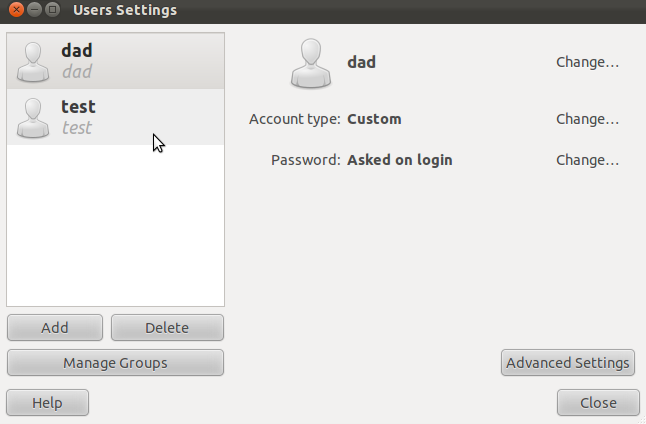 You can then manage users, including what groups they're members of, with this part of the GNOME Control Center. ...then you can manage users and groups from the command-line. You may be prompted for your password first (that's how sudo works). Then you're asked a series of questions. Besides their real name and password, if you don't have an answer to any of the questions, just press Enter. The user is made a member of the default groups for user accounts that do represent real human beings, but do not have administrative powers. Click here to read as text. To make a user an administrator from the command-line, just add them to the appropriate group. usermod is an excellent utility for this purpose. The -G flag means you're specifying one or more new groups, and the -a flag means you're adding these to whatever groups the user is already a member of, rather than replacing the old list of groups with a new one. You can edit users by going under System Settings (either search for it in the Dash, or select it as the first entry under the power cog) and selecting User Accounts. 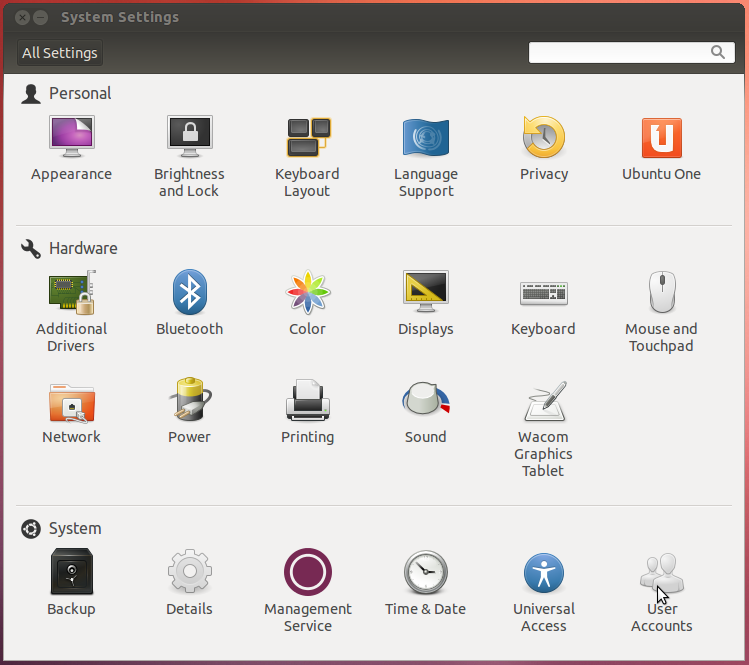 Alternatively, you may search the Ubuntu Software Center or use apt-get to install the gnome-system-tools package, then run users-admin afterwards to get to working with groups (source). For adding and deleting standard and administrative users I'd recommend that you use the standard tool Alex mentioned in his helpful answer. You will need to unlock the program and then click on the "+" on the bottom left. You can also administer passwords with this tool. If you need to add groups or add users to groups you can install the gnome-system-tools (Cross-platform configuration utilities for GNOME) package. You can add both standard and administrator users using the settings->user accounts pane. You can set the password after the account has been added. If you need more fine-grained control over which groups an account is in you will need to use the usermod program. Not the answer you're looking for? Browse other questions tagged gui users user-management or ask your own question. How do I add the “user and groups” application? How to set user rights in 11.10? Where's admin tools gone in 11.10? How can I add an account to the sudo list? Show battery as percentage, not time? Upgrading system to 12.04 using CD did not preserve my users - how's best to restore them? How do I addusers with passwords and assign them to groups and make them administrators?